What I Did on My Holidays. Part 4 – Trains. The mind blowing exercise of travel loosens the brain from its usual constraints, allowing it to think deep and profound thoughts. Thoughts such as: should I eat my pie now, or should I eat my pie somewhat later in the journey? I stood up from the bench, awkwardly arranged my rucksack, food-bag and laptop satchel, and waddled up the platform. The Overlander had pulled in. The Overlander was my first usage of my “Austrail” pass, a magical piece of paper which gives me six months of unlimited train travel around this gigantic island. It will take me between Sydney and Brisbane, it will do all the standard routes around the crowded south-east – Sydney, Melbourne, and their numerous hanger-on towns and cities. And, vitally, it does the prestige routes. The Overlander. The Indian Pacific. The Ghan. 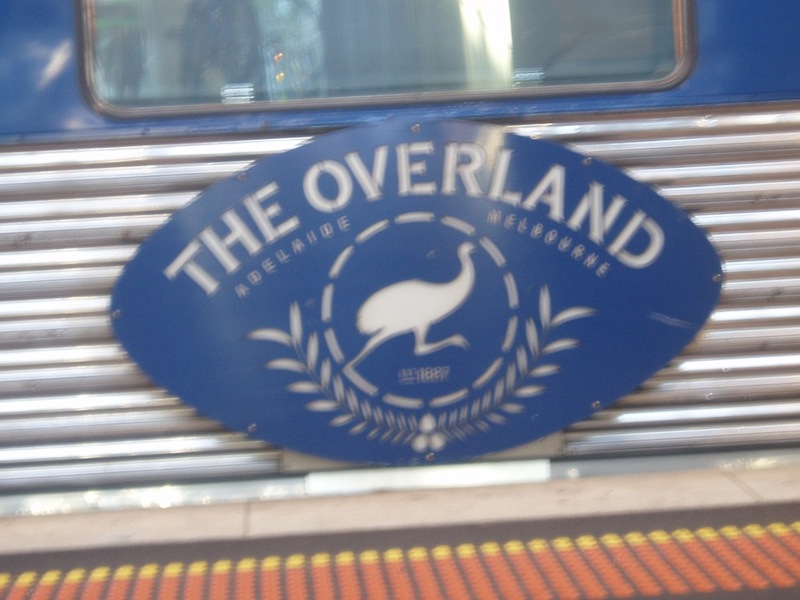 The Overlander is the smallest of these, a half-day worth of train between Melbourne and Adelaide (yep, I was turning around and going right back the way I’d come. Say what you like for my travels, they could never be accused of logic). It was also my swishiest piece of trainfoolery—cricket fans eager to see the Ashes test in Adelaide had completely booked up economy class, so I was forced to accept a $40 upgrade to “Red Premium”, which is effectively identical to economy class except that you get ALL THE LEG ROOM IN THE WORLD. They even provide little footstools in case the sheer volume of leg space makes you feel agoraphobic and you need to put something in the middle. To make this kind of acreage necessary, I can only assume that the service is a favourite among ogres. And giant squid. This was all baby steps, really. One day on a train? Pshaw. The Overland is a midget compared to what was to come. But first, I had a second visit to Adelaide. The problem with Adelaide this time around, as I mentioned the other day, is that I had nowhere to lay my head. Not even a nice blue Mitsubishi Lancer. Having plenty of time to mull this over in between putting off eating my pie (beef curry), I’d decided that my best bet was to find a 24hr McDonald’s or something, nurse a couple cups of dreadful coffee through the night, and catch up on sleep the following night when I got on the Indian Pacific for the 48-hour (yep) Adelaide-Perth train. But, as it turned out, it didn’t come to that. On the offchance, I checked the hostel I’d stayed in with Morgan and Russell the week before, and, due to a miraculous cancellation, got the last bed in the inn. I mean hostel. 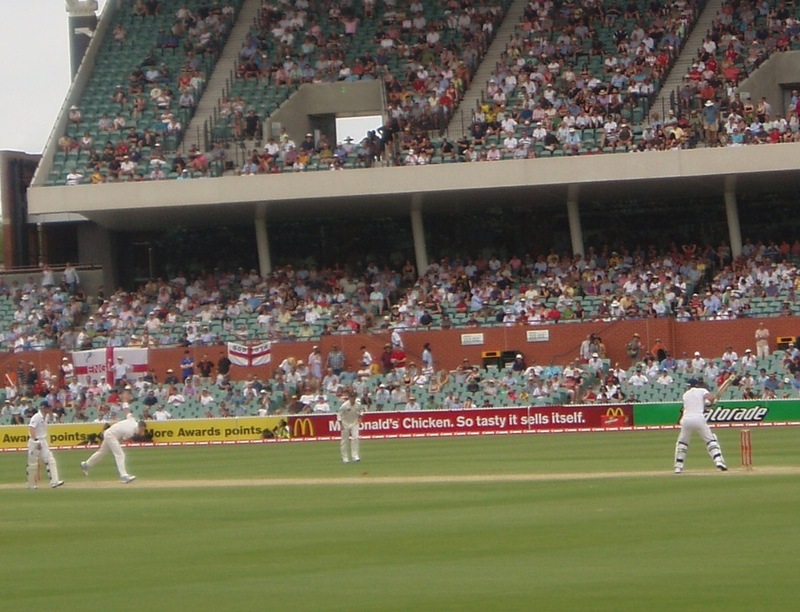 And luck was to continue; wandering down past the Adelaide Oval the next morning where the cricket was going on, I found a woman selling off a ticket (her husband’s, who’d had to go into hospital with a knee problem) for $20, for a nice seat at the north end. 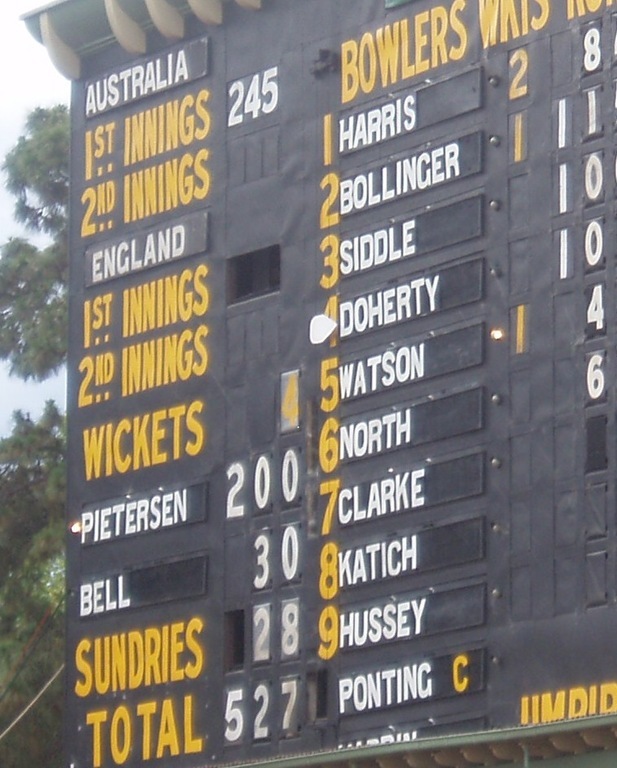 I went in; Kevin Pietersen promptly scored a magnificent 227. Not a bad way to spend your morning, really. Not, you understand, that Kevin Pietersen brought about the apocalypse, although it may have seemed that way to Ricky Ponting. No, what happened was; I got on another train. 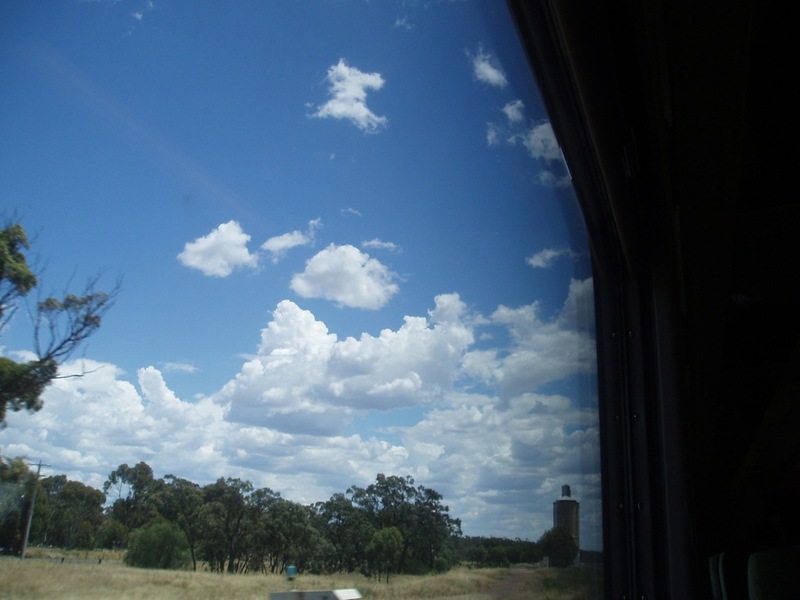 My five days on the Indian Pacific (2 days Adelaide-Perth, 3 days Perth-Adelaide, punctuated by a day in the scenic west-coast city itself) was the most intense experience of my travels. One of the most extraordinary things I’ve done in my life. It’s a whole new sense of scale, for a boy used to landscapes where there’s always going to be a town, or at least a forest or a river or something, in the next valley. Here, there is no next valley. It’s just flat. 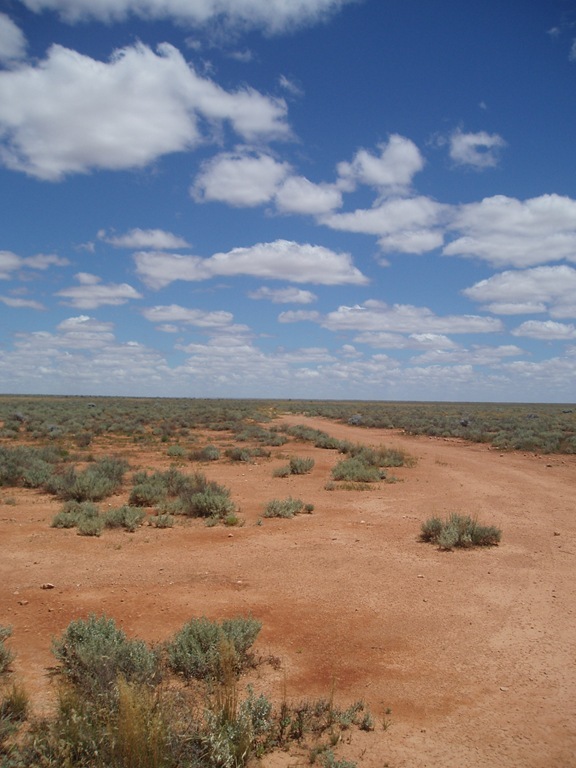 Flat, and red, and dry. At the ends of the track, in Adelaide and Perth, there is forest. As you get closer to the middle, there are bushes and low trees. And in the middle—and by middle I mean a thousand kilometers, including 477km where the track doesn’t make a single curve or turn—it is scrub. Red dust, ankle high grey plants, and more red dust, hour after hour after hour. 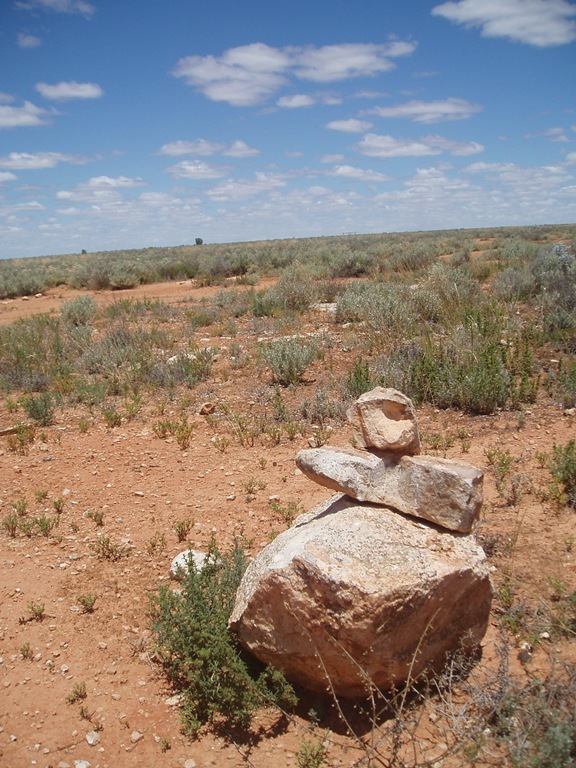 The region is called the Nullabor plains. Null abor: no trees. It’s so flat you can see the curvature of the earth. 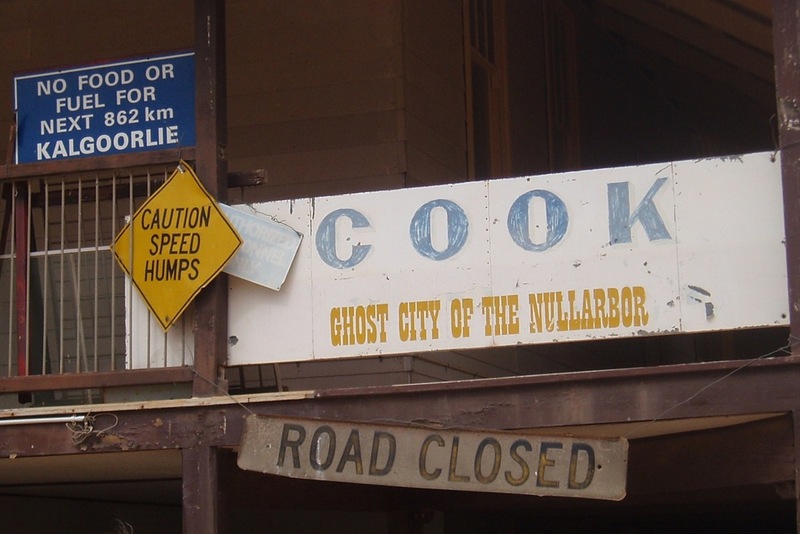 Those two pictures were taken in the town of Cook, if you can use the word town for a place with a population of five. Five people, hundreds of miles from anything, there solely to water the trains and man the gift shop. Can you imagine that kind of life? But what makes Cook really disquieting is that there used to be more. Back in the day, an entire community could live off being a railway town, servicing the steam engines. So Cook has a village; houses, gaols, a school. Standing in the dry, dry, dust. Not even waiting, not dormant, just standing. Abandoned. Buzzing gently with flies. It was 27 degrees outside when we were there, on this coldest summer for a decade; normally it would be anything up to 45. Standing in the dry, dry dust. Standing empty. It made me think, as many things do, of Eliot: “here is no water but only rock / rock and no water and the sandy road”. Wake, gaze and record the same memory; softly curving horizon of ochre soil. Sleep, wake, no kangaroo, sleep and wake. A large cloud resembles a goldfish. Eventually, when my sleeping, waking and (eventually) occasional glimpses of kangaroo had perpetuated themselves through a thousand mini-cycles, I got to Perth. You do go a little bit mad with that long alone, going through the same scenery; despite a good book (thanks Emil!) and some pleasant intermittent chat with my neighbours—a guy relocating from Adelaide to work in the mines, an enthusiastic German bloke called Michael, an Irish couple on a year’s working holiday—I did go through odd little…bursts, of melancholy, or of sudden, fierce impatience as my pampered intellect suffered withdrawal symptoms of stimulation. 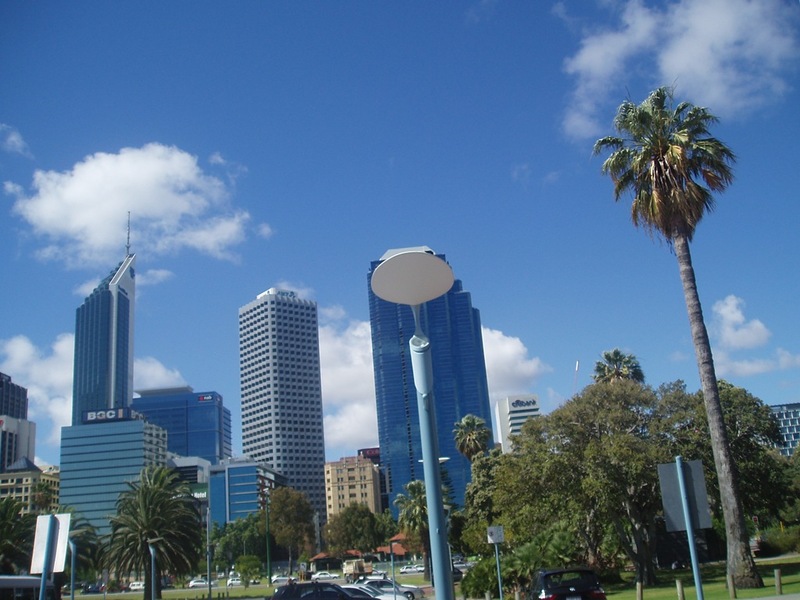 Perth was an oasis; trees! Buildings! Street signs which one could read! 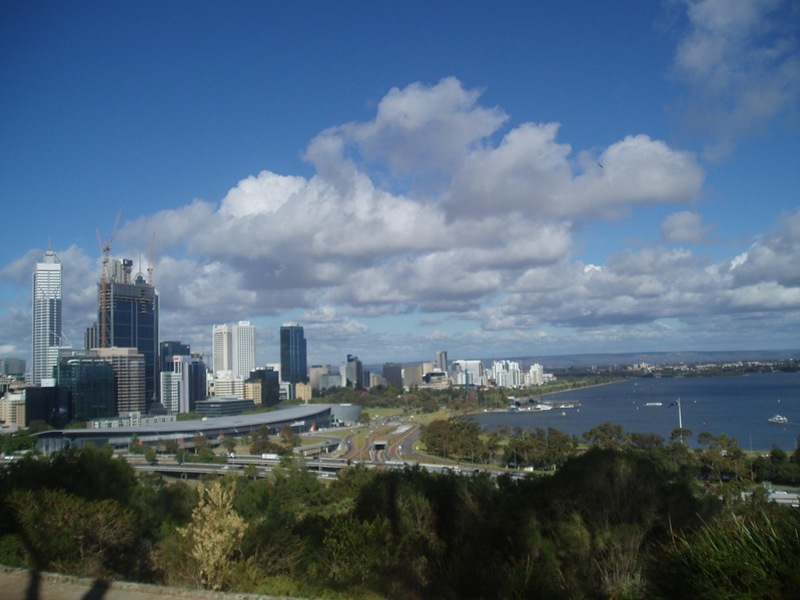 Owing to the craziness of the Indian-Pacific timetable, I had precisely one day to soak up as much of Perth as possible. I think I did a pretty good job: botanic gardens, CBD shopping areas, war memorial, aboriginal art gallery, museum, hostel. I then joined Liam, a pleasantly chatty Englishman from my hostel room, for a few scoops out in a local pub. A day’s not really long enough to get a proper feel for a place, but I think I got a taste of the most remote city in the world: a pretty, busy-seeming place on a slightly smaller scale and faster pace than Brisbane, set in a stunning region of bright green land girt by the Indian Ocean. Blue skies, blue water. Palm trees. The pub, meanwhile, was notable for serving me the first decent glass of ale which I’ve tasted in this strange land with its obsession with watery lagers; “White Rabbit Dark Ale”, it was called. Well done, Mr Rabbit. And so; and so. There and Back Again. The journey back was mixed up a bit by being on a different timeframe; so Kalgoorlie, previously seen in the small hours, was an evening stop. The train back was more social, too, largely thanks to chess tournaments instigated by an English couple sitting across the aisle. The other participants, an Aussie pair, were veterans of the train-line, and able to give us valuable local knowledge into the proceedings. 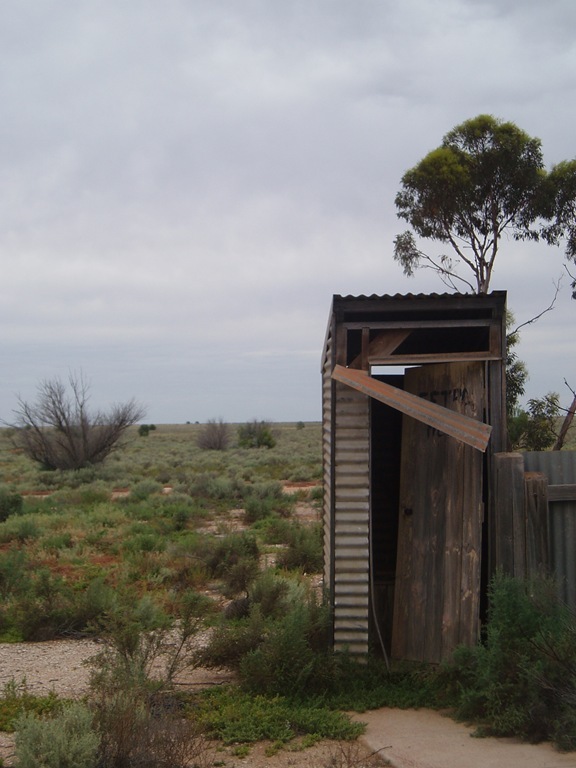 Kalgoorlie, for example, is the home of Australia’s oldest working brothel. Well, whaddaya know? Two days later, we passed through Adelaide, for my third visit. And then onwards into yet more new territory; frankly by this point I was getting a little bit sick of it, and really wouldn’t have minded a night or two in my own bed without any tourism. But that was just train gripes; my sense of wonder was to be fully restored when we got into Sydney. Which we didn’t do until significantly later than we planned, because the train tracks in New South Wales were flooded. More on that, on Broken Hill, on Surrealism, Opera Houses, beaches, Oprah Winfrey, and a little town called Canberra in my next—and final—instalment. Reminds me of an amazing five-day train ride from E to W Canada… I learned a lot on that journey. How beautiful yet haunting flat places are. What scale actually IS in terms of land. How much you really miss when you fly – flying is like stepping in a time machine, you come out the other side exactly the same. And you’ve passed all these possible experiences below you. Two things I learned most, I think, were that I am good at being on my own. It’s not that I “entertain myself” particularly productively – I hate that phrase, anyway, it’s like you have to entertain yourself with some kind of conscious show of being you, not just be content naturally, just by enjoying being you – it’s just that I feel comfortable. And one of the reasons I felt comfortable was because I am good at being by myself – I like me, me is productive and artistic and thoughtful and pleasant to be inside, there wasn’t any melancholy or madness to complain of (or, if you do indeed go mad when you spend that time alone – which I don’t buy as true, but as an individual trait – then I’d like to think I’ve retained that madness). But also, because that train really taught me how you’re never alone. The first night, I ended up talking until the early hours over strawberry sweets with a teenager. One day, the old boys in the observation deck adopted me, told me all about how train engines work and fed me coffee. Then there were the three Finish backpackers, and the two Canadian girls, and the guy I ended up handing out with in Vancouver for two days when we finally arrived. I am now confident that I could walk into a half-empty carraige of people and walk out with life knowledge and contacts – and having seen where I’m going.